Main pageMERCHANDISE"Shap Side" sticker 4pcs. Normally we will pack two of each type. If you wish more from one version, please note in the comment section of your order. One free sticker comes with every "All In" Set or any purchase over 50 Euro. 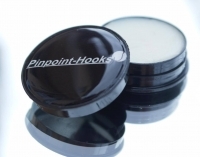 The Pinpoint-Hooks "Hook Safe", prevents your hooks from damage and corrosion! The Pinpoint-Hooks "Grease", prevents your hooks from corrosion and rust!